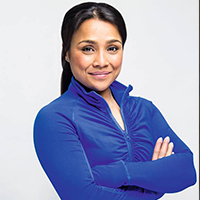 An author of “how to fall in love with your body” and the founder of Fitness Reborn UK, Nazia Khatun has overcome obstacles in her journey as a Muslim, Bangladeshi boxer and speaks about her journey living with an eating disorder and how her depression was tackled. She speaks about the topics that are associated with a taboo and brings light for healing. Her role as a Body Transformation coach has seen females regain their confidence and self-esteem by using fitness as a tool to reprogram their mind set and creates a new attitude towards food and exercise but most importantly her mission is to help people to fall in love with themselves. Nazia has been featured on BBC news and also a part of the ADR Rothchild’s programme where her organisation was seen as having a positive social impact for change.